The globalist system is now being torn apart, Trump is now warning the WTO that if they do not change their ways the US is out. This is a message to the globalist and the central banking system that things are about to change. The MSM via the central bank is now pushing the new narrative that the economy is not doing as well as Trump says. We know the economy is actually worse off, nothing has changed, the only thing that has changed is who is in office and it looks like the establishment is preparing to have the economy come down before the next presidential election. Facebook is now being investigated by the SEC. Strzok said was going to testify to congress in a public forum but has now backed out because his attorney says its a trap. The Judge in the Flynn case moved the date up, Mueller wanted it sometime in August. Merkel surrenders immigration to keep her party intact. Iran has met with the Swiss and they are on the same page in regards to the nuclear deal. Russian troops arrive in Syria near the border of Jordan. Syria liberated 27 more areas and has made an announcement letting the people know they can come back to the country. Syria says it is time for the US to leave Syria, there is no reason for the US or the coalition forces to be in their country. 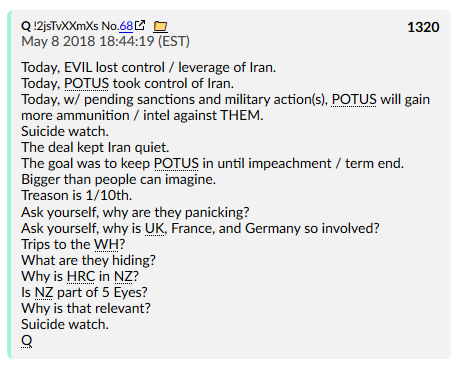 Q has dropped many bread crumbs, they have the server, the deep state is cornered and their are now coincidences. President Donald Trump issued words of warning for the World Trade Organization on Monday, calling on it to start treating the United States “properly” or the U.S. will take action. Consumer spending just wasn’t coming in where the government hoped, despite the tax cut that put more money into people’s pockets. The Atlanta Fed is now predicting that the quarter that ended Saturday will show a 4.1 percent annual growth rate. That’s a nice number but way down from where the Atlanta Fed was just a few weeks ago with its estimate. Two things to remember: It’s only one quarter and combined with the first quarter growth of just 2 percent, it doesn’t mean the economy is growing quickly. And — this is important — we’ve had one-quarter economic spurts before only to see the economy fizzle. The FTC disclosed in March that it had launched an investigation into whether Facebook had violated a consent decree over its handling of personal data – a violation that could potentially lead to more than $1 trillion in fines. And given that the SEC is now involved, it’s possible that the timing of CEO Mark Zuckerberg’s stock sales has also come into play. Peter Strzok’s attorney says the beleaguered FBI agent may decline a House Judiciary Committee invitation to testify on July 10, despite previously expressing interest in doing so – over what his attorney Aitan Goelman said would be a trap. An agreement was reached which would provide for transit centers to vet the claims for asylum offered by incoming migrants, the refusal to accept secondary migrants, and the potential deportation of those who have originally filed for asylum in some other European country. This plan, if implemented in its present form, reduces Germany’s refugee liability almost to nothing, since, given Germany’s geography, it is not on the front line of the waves of migration, as those migrants need to travel through another EU nation to get to Germany, and if Germany is turning away asylum seekers who have filed for their asylum in another EU nation, and secondary migration is not permitted, then Germany could realistically expect not to see further waves of migrants. Merkel has lost in a big way, and the anti-migrant interests have won, not just at home, but across the bloc. She has conceded much and nearly lost her handle on power, which is largely maintained through acquiescence to the demands of other countries in the Union. . The Russian military has reportedly arrived at the outskirts of Busra Al-Sham this morning, as the rebel forces prepare to handover their heavy and medium weapons. Busra Al-Sham is an imperative city that is located just north of the Jordanian border and directly west of the Al-Sweida Governorate. With Busra Al-Sham under a reconciliation deal, the Syrian government will have full control of the Al-Sweida provincial border for the first time in several years. 27 settlements in southern Syrian have returned to the government control over the past week, a spokesman for the Russian Center for Reconciliation of the Opposing Parties in Syria said on July 3. Sen. Lindsey Graham (R-SC) made a surprise visit to Syria on Monday, stopping off in the city of Manbij, Graham delivered a speech clearly designed to attack the idea of a US pullout from Syria. Graham insisted that the US needed to “stay here to help,” and that it would be “terrible” if the US didn’t have any troops in Syria in the future. Damascus said that the United must withdraw its forces from Syria, stressing its military presence in the Arab state no longer makes any sense amid the successes of the Syrian government’s forces on the ground. 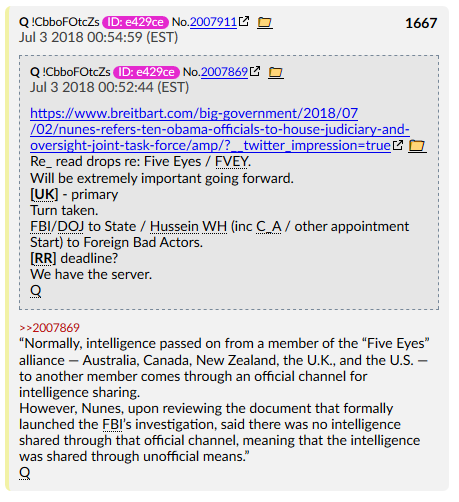 Nunes, in a letter to the chairmen of both committees obtained by Breitbart News, listed ten current and former U.S. officials who may have received or provided information relevant to their investigation…. Nunes’s letter also lists Colin Kahl, former national security adviser to former Vice President Joe Biden, another former Biden aide… as well as former top Clinton State Department aide and campaign official Jake Sullivan. 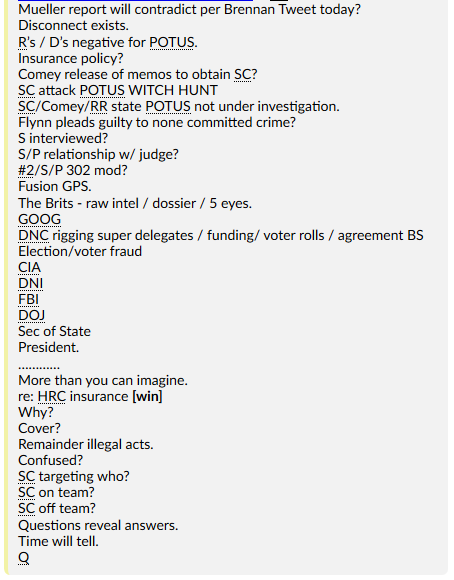 So what I think you’re going to see in the testimony that follows from all this, is the revelation of what these “unofficial channels” were; specifically who they involved. 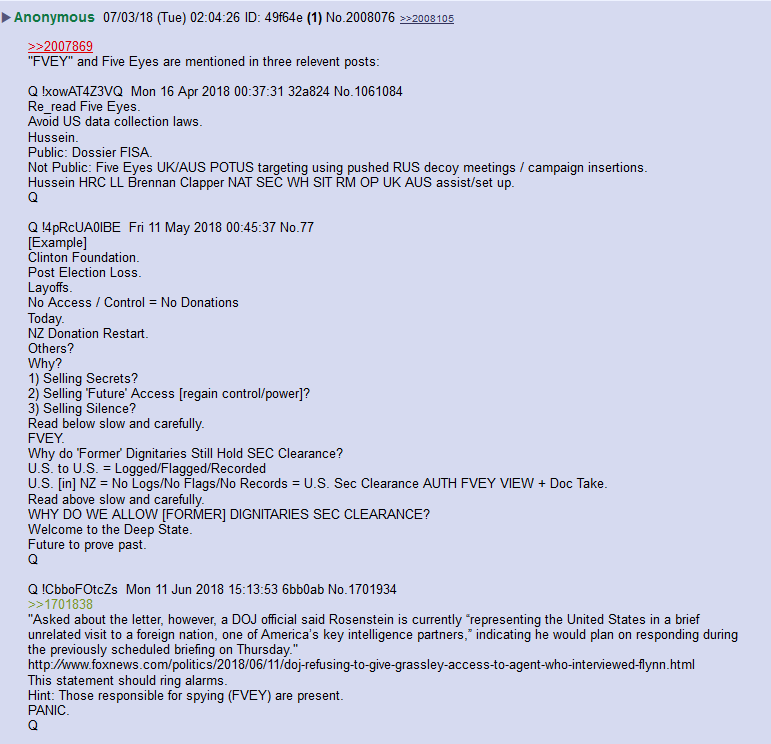 I believe Q is saying the UK was the primary point of contact for those looking to ferry information along these unofficial channels, and this will implicate the FBI, the DOJ, the CIA, and Obama’s White House. And how is that for a #Boom? 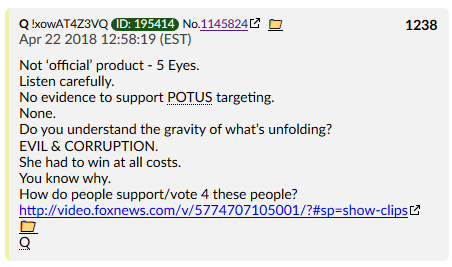 Q liked that line, too. 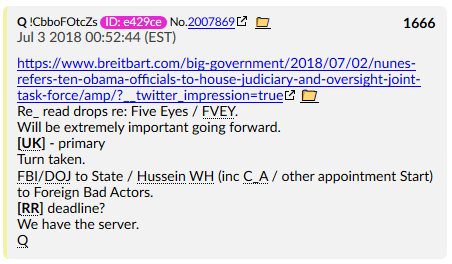 Q is emphasizing the “official” vs “unofficial” channels here for a reason. Unofficial channels implicate Obama (and, by proxy, HRC – and I imagine, many of the 13 Angry Democrats, if not all of them)! 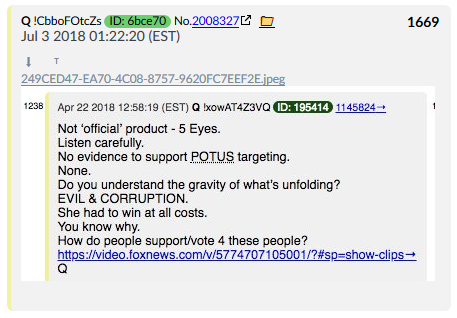 If you’ve been following Q for a few months, you have to remember this. If the bad guys went through US agencies, there would be a “paper” trail. Because they’re going through #FiveEyes, they can read whatever is procured without a paper trail, and take that intel with them. 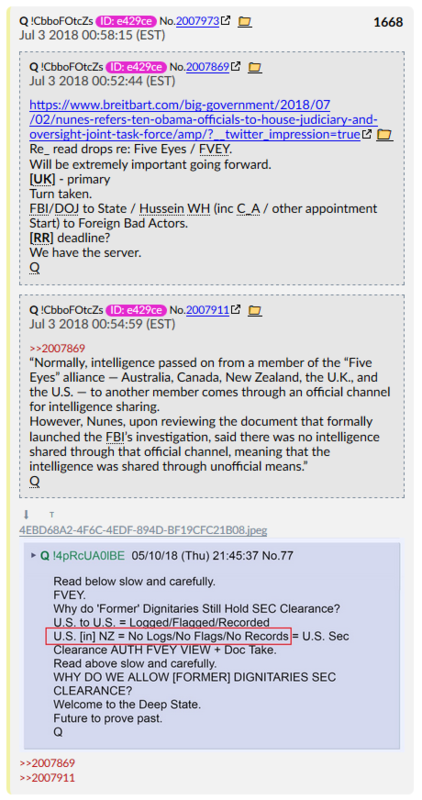 The reason Qteam allowed this was to follow them and gather more evidence of crimes. Like when HRC was allowed to go to New Zealand. She wasn’t getting away with anything. Her phone was comped the whole time, and they probably had agents tailing her everywhere, and satellites trained on her every move. She thought she was turning the tables. In fact, she was just adding fuel to the fire. The corruption goes all the way to the top! 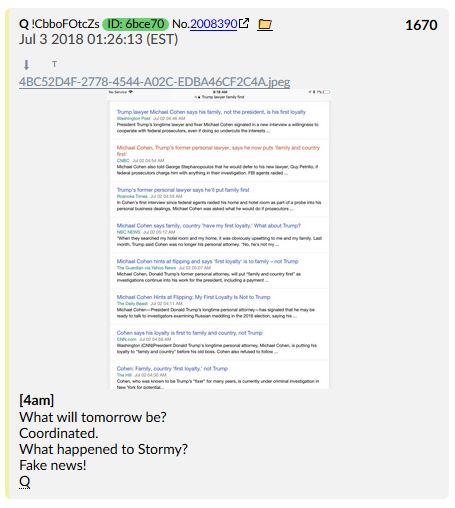 Stormy’s old news! 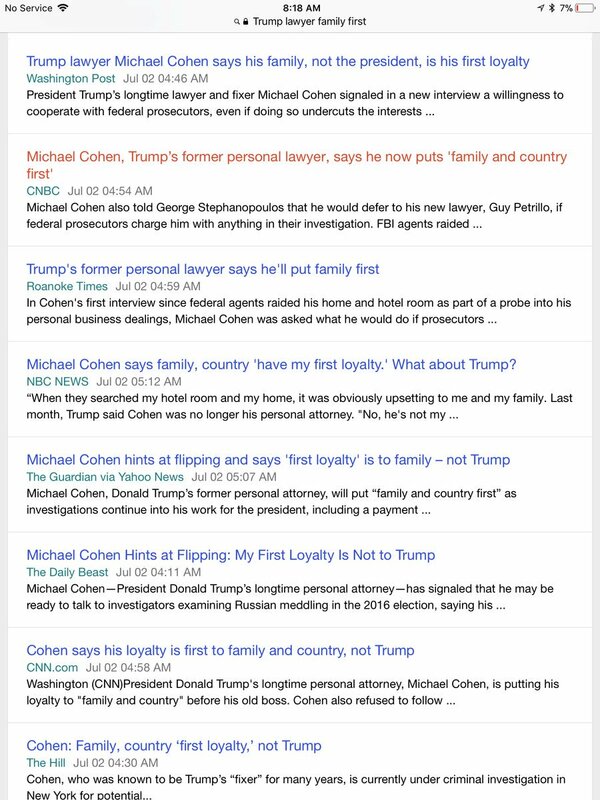 It’s not sticking any more, so the tactic is to shift gears towards Michael Cohen. And look at how all the Mockingbirds fall in line! Thursday can’t come soon enough! Do you think this was going to be litigated in this setting? Case that implicates some of the most senior elected officials (treason) is being handled by the appropriate office. Why was the case against AWAN filed under BANK FRAUD? The result today is re: BANK FRAUD. 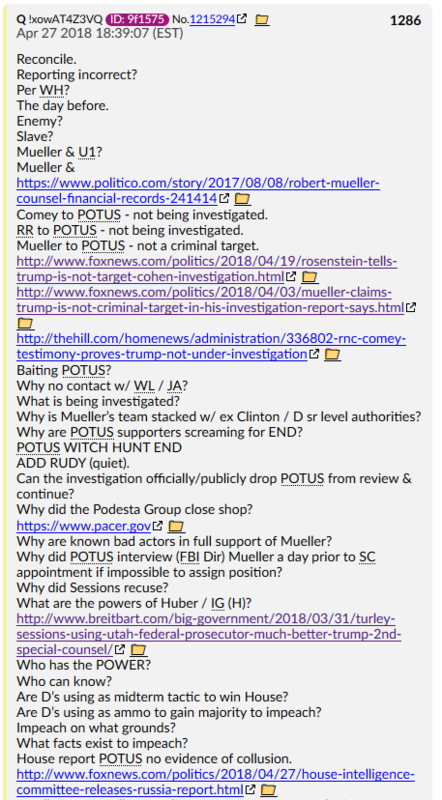 Early Q drops point to that this is pointing to being handled by MI. Another setting would also be Huber. The DOJ promised not to charge him with prior non violent crimes! The DOJ would not prosecute Treason. That would fall to a Military Tribunal… promise kept! DEFINITIONS, PRETRIAL CONFERENCE, PROTECTIVE ORDERS AND DISCOVERY – After a criminal indictment becomes public, the prosecutor remains responsible for taking reasonable precautions against the unauthorized disclosure of classified information during the case. This responsibility applies both when the government intends to use classified information in its case-in-chief as well as when the defendant seeks to use classified information in his/her defense. The tool with which the proper protection of classified information may be ensured in indicted cases is the Classified Information Procedures Act (CIPA). See Title 18, U.S.C. App III.CIPA is a procedural statute; it neither adds to nor detracts from the substantive rights of the defendant or the discoery obligations of the government. Rather, the procedure for making these determinations is different in that it balances the right of a criminal defendant with the right of the sovereign to know in advance of a potential threat from a criminal prosecution to its national security. See, e.g., United States v. Anderson, 872 F.2d 1508, 1514 (11th Cir. ), cert. denied, 493 U.S. 1004 (1989); United States v. Collins, 720 F.2d 1195, 1197 (11th Cir. 1983); United States v. Lopez-Lima, 738 F. Supp. 1404, 1407 (S.D.Fla. 1990). Each of CIPA’s provisions is designed to achieve those dual goals: preventing unnecessary or inadvertent disclosures of classified information and advising the government of the national security “cost” of going forward. This order prescribes a uniform system for classifying, safeguarding, and declassifying national security information, including information relating to defense against transnational terrorism. Our democratic principles require that the American people be informed of the activities of their Government. Also, our Nation’s progress depends on the free flow of information both within the Government and to the American people. Nevertheless, throughout our history, the national defense has required that certain information be maintained in confidence in order to protect our citizens, our democratic institutions, our homeland security, and our interactions with foreign nations. Protecting information critical to our Nation’s security and demonstrating our commitment to open Government through accurate and accountable application of classification standards and routine, secure, and effective declassification are equally important priorities. This year, Schools recommended that then-Deputy FBI Director Andrew McCabe be fired for a “lack of candor” in an internal investigation.